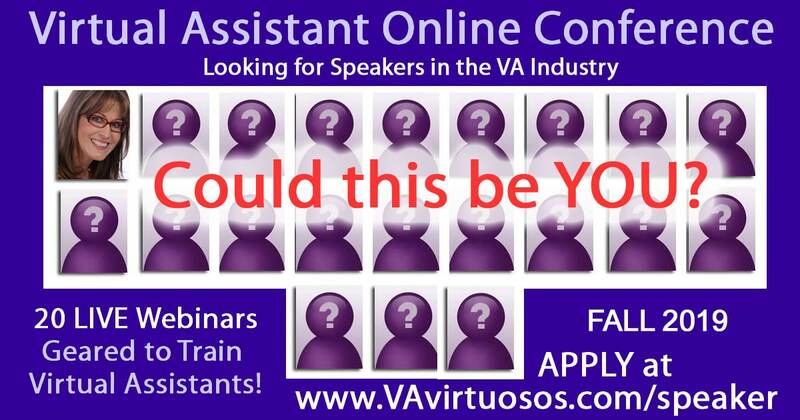 We are seeking engaging “Virtual Assistant” SPEAKERS for our next #VAVS Season 18 online conference. This is our 18th season (hard to believe we’ve done this 16 times already LOL) and we welcome any Virtual Assistants, at any stage in their business (who have something to share with their peers) to speak with us. Deadline for speaker application is TBA. During this series of online seminars, we will be presenting a speaker stage of engaging Virtual Assistants who currently run a successful VA business or have in the past. Virtual Assistants who have already went through the bumps and grinds of getting their business going and have figured out what works and what doesn’t in their business to share with their peers. Learn from other business minded Virtual Assistant business-minded at this series hence our theme “From One VA to Another”. Whatever topic you think other Virtual Assistants would like to learn! If you have some other topic that revolves around our theme please suggest same when you apply below. FREE GOLD TICKET to the event (value $97). Get paid to speak with us. You can earn 50% affiliate income on every ticket you sell through your lists up until the end of the series. Advertising on our high ranking website. You will be featured as a speaker on our website which includes your name, bio, URL, picture and description of your topic for approximately 5-6 months (or until our next #VAVS). Social Marketing Exposure: Five Tweets by @vanetworking and one post on our Facebook Page over the course of our promotion period. Optional marketing: Our speakers also have the opportunity to guest blog with us, donate prizes and do affiliate joint ventures with us. Opportunity to build your list. To show our appreciation for your time and knowledge shared with our network feel free to share a freebie ebook or whatever with our attendees at the end of your webinar to entice them to sign up to your email list. Once you have them on your list you can send them whatever you want to sell! MP3 copy of your webinar to use however you wish in your future marketing plan. Banner ad on our sponsor page which you provide. What do we expect from you in return? An educational 1-hour webinar on a topic that would benefit a Virtual Assistant. Dedication and commitment to meet all deadlines required by speakers (includes attending one 15 minute webinar room orientation and getting all your documentation to us by our due dates. A fun and worry-free speaking experience (especially if this is your first time speaking). To apply before the deadline please fill out the form below completely. We will notify all accepted applicants on TBA. If you have any questions, fill free to drop me a call Toll-Free North America 1-800-642-6313 or local Vancouver, Canada 604-542-9664 to discuss.